Will D. Cobb (July 6, 1876 – January 20, 1930) was an American lyricist and composer. 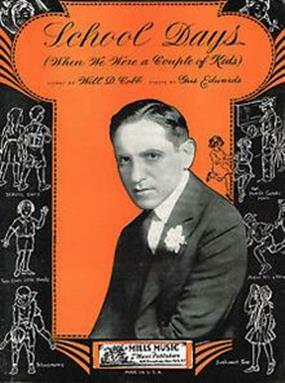 He had a writing partnership with Ren Shields that produced many popular musicals and musical comedies at the start of the 20th century. He also had a long time collaboration with Gus Edwards. Cobb was a prolific lyricist and composer in the early 1900s. His career spanned from approximately 1901 through the late 1920s. Early in his career, he collaborated with Ren Shields, best known for his hit, In the Good Old Summer Time. Over the course of his career, he worked with Buddy DeSylva, George Gershwin, Harry Ruby, and Earl Carroll, among others. He joined ASCAP in 1927, his chief musical collaborator was Gus Edwards. He is responsible for writing the line still sung by schoolchildren in the United States, "School days, school days; dear old golden rule days. Readin' and 'ritin' and 'rithmetic; taught to the tune of a hick'ry stick," which came from his song, School Days, published in 1907. Cobb, along with Paul Barnes (music), penned the lyrics to the US & British wartime song Goodbye Dolly Gray in the late 1800s. In the early 1900s, the song was adopted with re-written lyrics, as the theme song for the Australian Football League club, Collingwood.